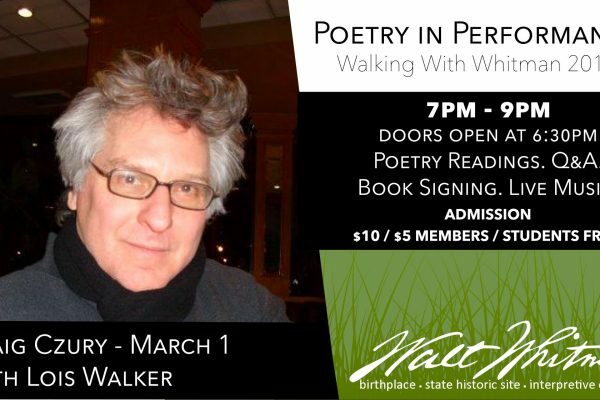 WWBA presents the 9th season ofPoetry in Performance:Walking With Whitman, hosted by Writer-in-Residence, George Wallace. The signature series continues to bring to bring the most intriguing figures in contemporary literature on the national scene paired with local poets to the Walt Whitman Birthplace Stage. Admission: $10 Non-Members. $5 Members. Students FREE. Poetry Readings. Q&A. Book Signing. Live Music. Refreshments. Musical Performance by Tommy Santoriello and Margaret Lassen. Craig Czury (M.F.A. creative writing Wilkes University) has spent over three decades conducting energetic workshops of poetry, life-writing, and writing as healing in schools, universities, community centers, juvenile detention centers, homeless shelters, and mental hospitals. A lecturer at Albright College, an editor, publisher, and tireless arts advocate, Craig is the author of over 20 books of poetry, most recently Thumb Notes Almanac: Hitchhiking the Marcellus Shale (FootHills Publishing 2015), a poetry documentary woven from his hitchhiking interviews in the heart of “fracking” in his home region of Northeastern Pennsylvania, and Fifteen Stones (NY Quarterly Press, Sept. 2017). Craig lives, teaches, plays bocce and makes poetry happen in both Springville, Pennsylvania and Soncino, Italy – and everywhere in between. Lois Walker, a retired school teacher, is a widely published poet, a retired chairperson of the Long Island Poetry Collective, a past editor and production manager for XANADU, an international little magazine for poetry, an editor for other volumes of poetry and art as well as a practicing artist. She has read her poetry in Manhattan and on Long Island many times. She read her “Nadezhda Poems,” (a sequence written on poets persecuted under Stalin] in Santa Monica, California for “Inner Exiles: Shadow Poets, Paintings & Poetry” a solo show of her art work at the Sylvia White Gallery. From the early eighty’s into the ninety’s she hosted “Sound of Poetry,” a radio show from Adelphi University in Garden City. In the 80’s she also served at the Huntington Arts Council for New York State Decentralization Grants. She works with individuals as a consultant for their writing and of course enjoys working for groups under the sponsorship of Taproot Workshops Inc. Her visual artwork has been shown in Europe and throughout the United States. Tickets can be bought at the door, or by calling 631-427-5240 x115. Tickets available here. This series is funded by Poets & Writers, Inc, with public funds from NYS council on the Arts with the Support of Governor Andrew Cuomo and the NYS Legislature.